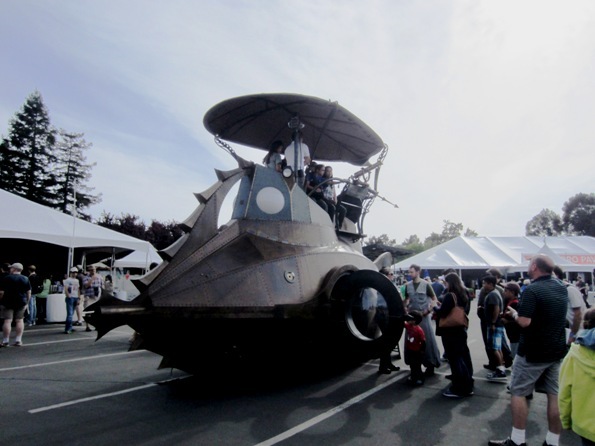 I’d never been to the Maker Faire before, though it’s held annually and I’ve been hearing about it. 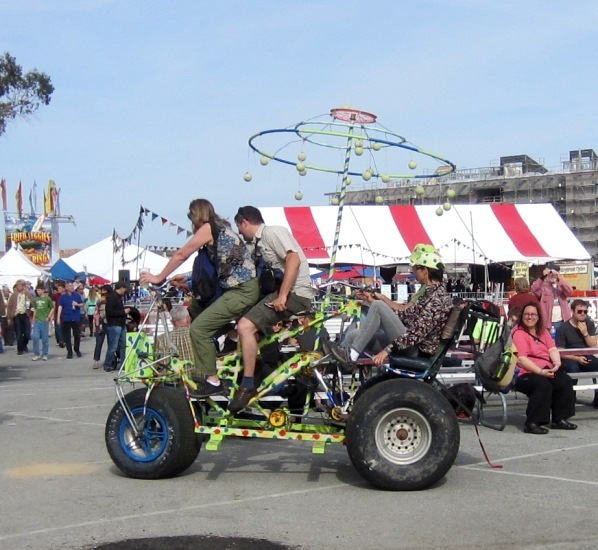 It’s a fair for people who make things, whether from Legos or junk or fabric or wood or electronic parts. It sounded intriguing, and I thought my still-an-engineer-at-heart husband would find it interesting too. So we went. It was huge, occupying all of the San Mateo Event Center. It was awesome. This tower of flames is a strength machine. You hit a lever with all your strength, and depending on your strength, you get 2, 4, 6 or 8 bursts of fire. The small kids were getting 2-4, the 10-12 year-olds usually managed 6, and the teenagers easily achieved 8 flares. Like this picture. I’ve been reading about 3-D printing for a while now, but this was my first chance to actually see it in action. I lost count of how many booths there were with 3-D printers, mostly making small plastic objects. One was working with organic materials; 3-D printing is being developed as a possible way of making human organs. 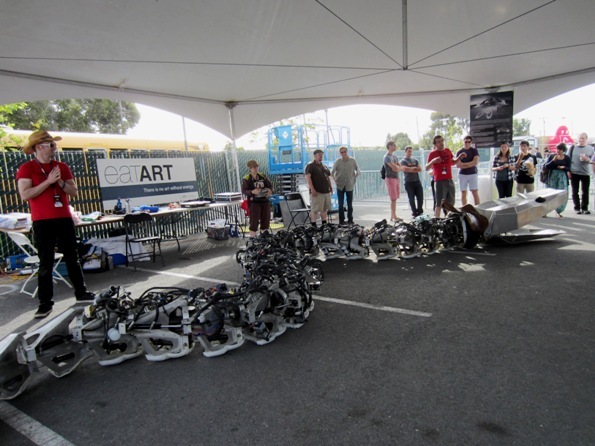 The other big theme was drones – flying objects that have multiple propellers and a lot more capability than remote-controlled toy planes. Some have cameras. One booth had a drone fitted with a 3-D camera, with the idea that it could record and then 3-D print people’s faces. He couldn’t demo it because his remote control used infrared, and the outdoors area was too bright. 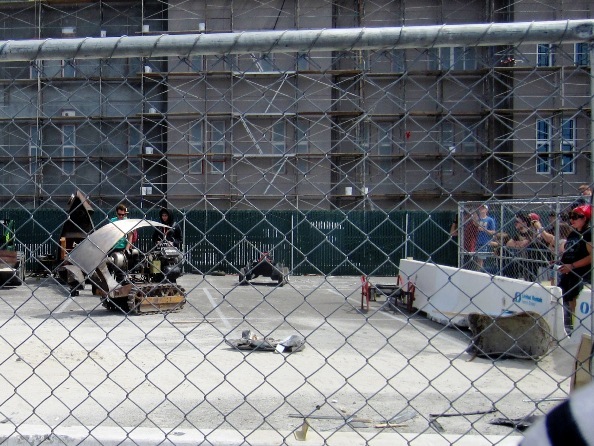 Inside the pavilion, there was a Drone Wars area. We didn’t stay for the main heats, but we did get a chance to watch several kinds of drones flying inside the netted arena. They seemed a bit delicate. One crashed, slightly damaged, and looked for all the world like an injured dragonfly trying to get off the ground again. Some of it was sheer spectacle. 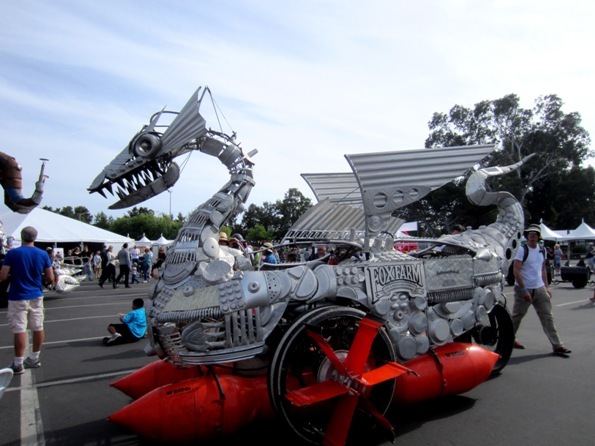 They had kinetic sculptures, moving monsters made of recycled metal junk. 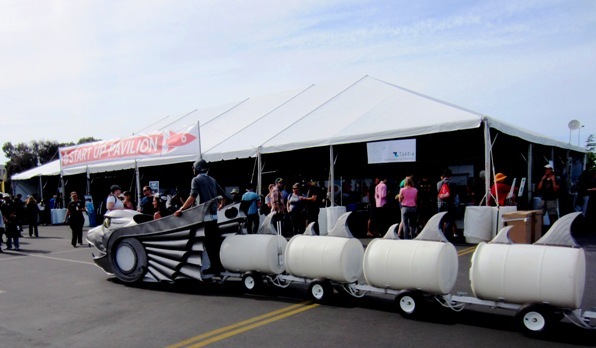 They were powered by batteries, presumably lithium ion, or propane. Some emitted gouts of flame. 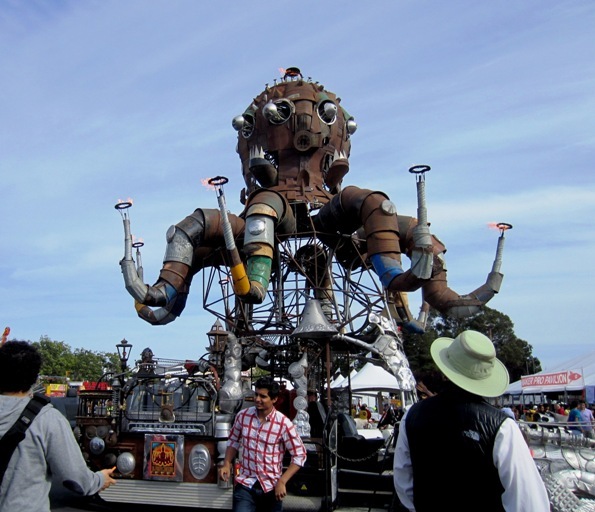 This one is called El Pulpo Mechanico (and the video linked above shows it flaming from its tentacles). 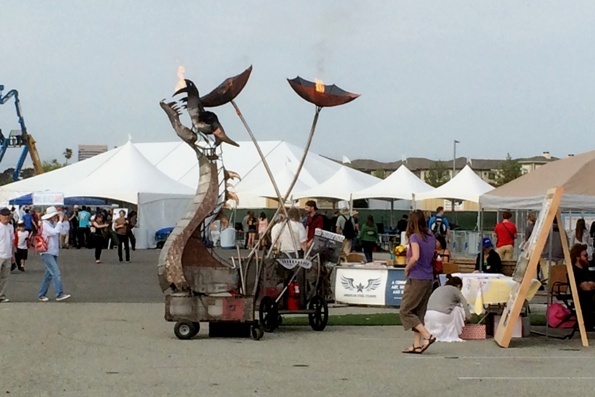 This dragon breathed fire – and so did the umbrella-shaped flower beside it! I’d love to see this water-dragon on a lake; it looks like it would work. But that day, it was marooned on a parking lot. This is the Titanoboa, a mechanical representation of a now-extinct snake. Not too sure what this was, but it looked like a metal fish monster and people were lining up to go aboard. They had a whole bunch of creative conveyances. This buggy was I think pedal-powered. There were two of these mobile serpents racing around the grounds. The black one was more impressive, with fins on every segment and scales, but I didn’t get a good photo of it. Here’s the white one. 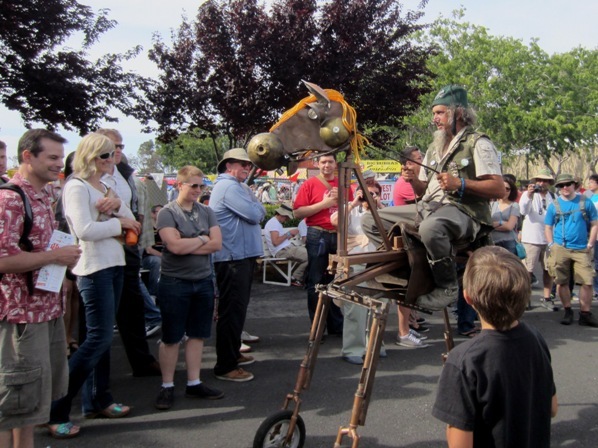 This mobile rocking horse worked with person power, only the rider had to post like he was actually riding, rather than pedaling in a circular motion. It looked exhausting. But the horse was cute and got a lot of attention. 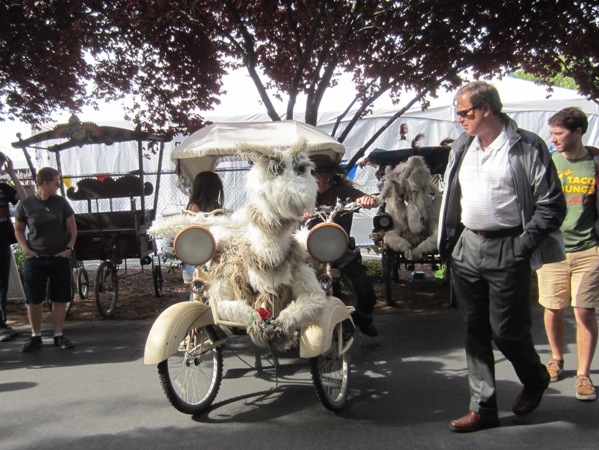 These two are “creature quads” – pedal-powered four-wheelers “drawn” by fuzzy monsters. This is Hawk (who can unfurl his wings), and Miss Tickle is in the background. These had an even higher cute factor, and visitors kept stopping them to pet them. It wasn’t all machines and monsters. The faire had a substantial fabric arts section, too. 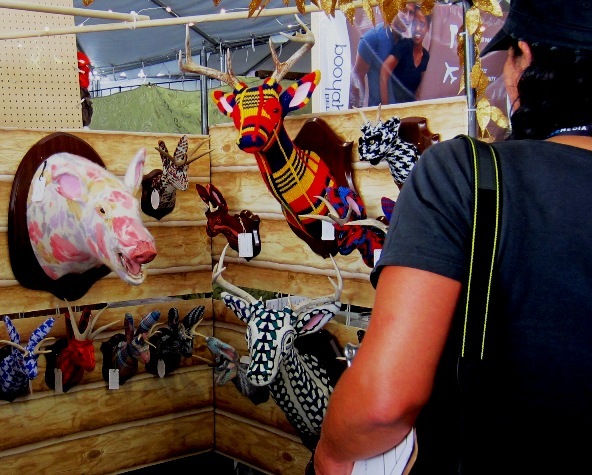 This was my favorite: Sweaty Taxidermy. She does taxidermy without actually using animal skins. Instead, she uses sweaters. The effect is arresting. There were more traditional things, too, like clothes and jewelry, a lot of it with a steampunk motif. There were all kinds of robots. 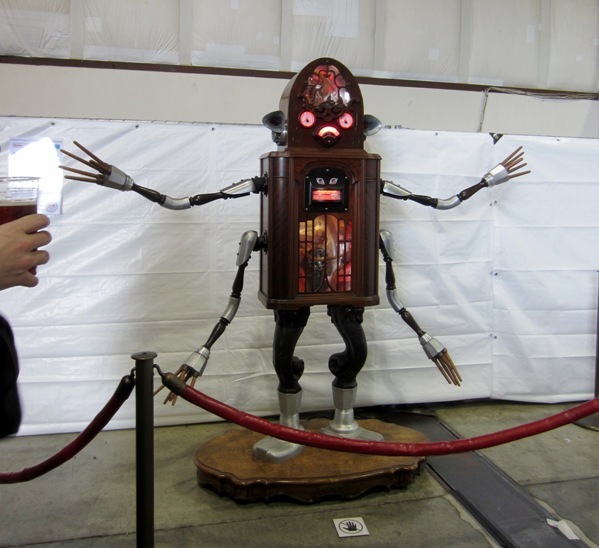 This one was humanoid, and looked like we imagine robots to be. It looked more decorative than functional, though. These two were a bit different. 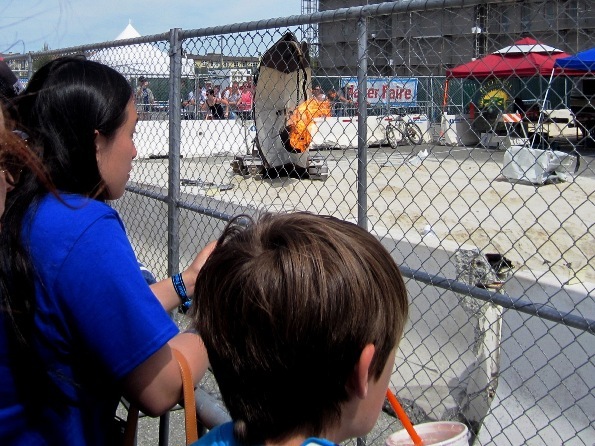 They had to be contained behind a chain-link fence; this tall one raced around swinging a ball of fire. Its companion was a demolition robot on caterpillar treads, crashing into metal objects provided for it to destroy. 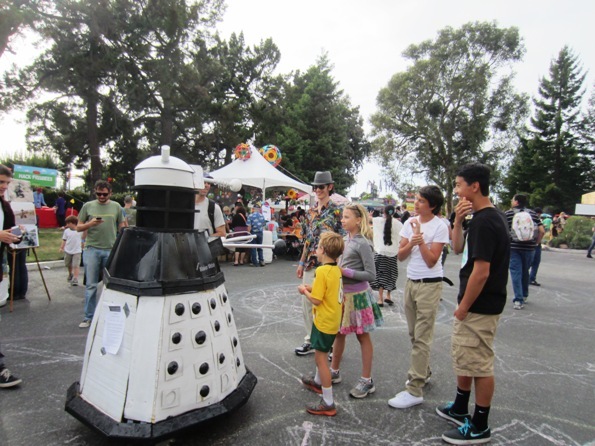 And then there was this Dalek (a Dr. Who villain). It said “Exterminate” a number of times, but it didn’t follow through. Fortunately. 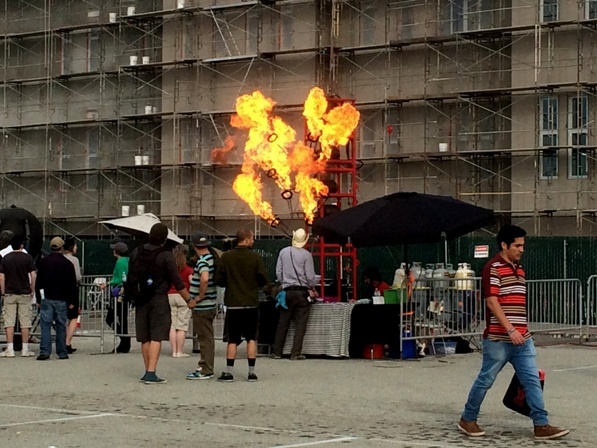 This entry was posted in General, Intriguing Products and tagged creativity, events, Maker Faire. Bookmark the permalink.